There is always something unsettling and creepy about our memories of school. Almost everyone had “that” teacher who tends to reappear as a projection of our fears during stormy nights all through our life. But on those nights, teachers might find students in their nightmares too. Matt Parvin’s claustrophobic play, Jam, shows how it is when those incubi become real. In a countryside school on a Thursday evening, Bella’s plans to leave her classroom are changed by the arrival of Kane, an ex-pupil with ADHD who haunted her past and forced her to rebuild her life elsewhere. He comes seeking confrontation, and old wounds, never quite healed, are reopened. Parvin’s characters are both lost souls, looking at the same time for absolution and reprisal of a tense battle that obviously sees no winners. Like its characters’ souls, the script seems a little lost: trying to touch on almost every possible social and personal topic, Parvin’s play puts too much on the table without developing enough and the result is rather muddled. The real strength is in the two flawless performances delivered by Jasmine Hyde as Bella and Harry Melling as Kane: two sides of the same coin, chasing and challenging each other both physically and mentally, alternating in the Master and Servant roles of an obsession. Hyde’s Bella tries always to be in control, using her language and her role as protection and to hide her rage and frustration, but it’s when her mask slips during the climax that her performance becomes the powerful and excruciating scream of a hurt Erinyes. Harry Melling is the star of this production: a manipulator who plays with Bella’s sense of duty (and with the audience’s feelings towards him) but also a fragile child unable to grow up, stuck in the memories of his schooldays. 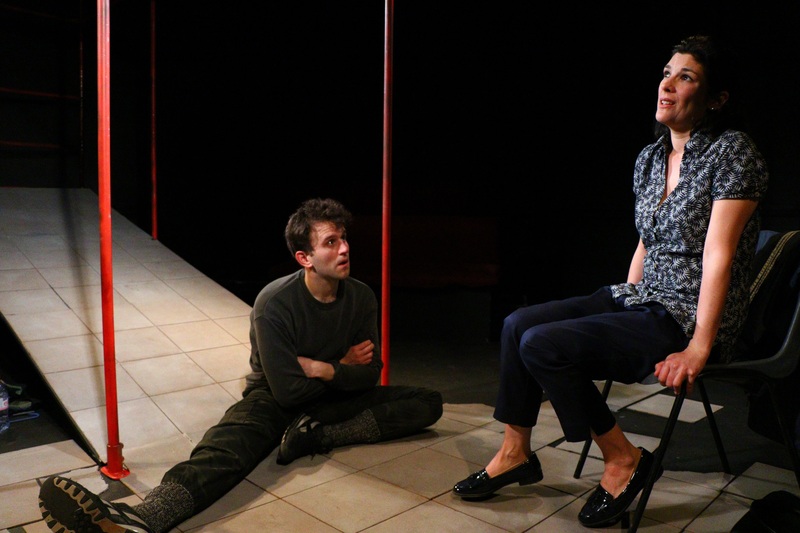 The audience cannot avoid being utterly captivated by this troublesome boy who jumps around the stage, who climbs up and down Emma Bailey’s minimalistic set and who, among many lies, seems to tell quite a few truths. There is a great and mature performance here. In the end, Jam is not a perfect play but is truly thought-provoking, causing the audience to question themselves long after the curtain calls, and therefore deserving to be seen. Jam runs through June 17.